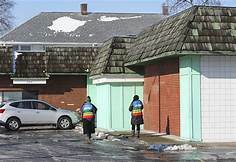 Toledo Abortion facility open 9 days in March. Anywhere from 13-25 women came to CCN on one of these days in March! Immediate need - 9 days /over 120 women In March. "Up to 75% of clients don't stop for their appointment when people are praying outside the clinic." - Unplanned, 2019. ​1,344 moms2b will be considering abortion at the Toledo facility in 2019. Help us change their future. Our future. CHANGE OUR NUMBERS NORTHWEST OHIO. Give $50. Pray 365. Love louder NWO. Adopt a Mom2B with a commitment to pray 365 for them, their baby, their family and their decision. If the date you choose has already been adopted, you will be given the next available date and emailed your new date of Moms2B to pray for and support. Indicate the name of adopter: individual, family, group. Your donation, while not required to adopt a MOM2B, is a crucial part of this adoption as it may be the reason the doors to Toledo's last abortion clinic are finally closed permanently! You can give a one time gift of $50 or even as little as $5 a month. Please consider giving as well as praying for your MOM2B. These Moms2B are real. We don't know them personally but we have seen them coming and going from the Toledo abortion facility, pregnant and considering abortion. They need you! They need your prayers, your support to make this decision less likely and your love regardless. Will you adopt a day of Mom2B's in 2019? Adopt as a family, a church, a bible study group, as friends or as a single person passionate about life in the womb with a willingness to love louder. When you adopt a day, you are praying for pregnant women who walk in to Capital Care Network that day. Pray that they have the support they need to choose life, that they and their baby are healthy, that they hear about alternatives and the reality of abortion, that they encounter Christ...you will be praying for them all through 2019, before, through and after their decision. We will not know who went through with an abortion and who changed their mind. We do know that we can make a difference with Prayer and if we close Toledo's last abortion clinic. Together, it will matter. It will make a difference for life in NWO. Tuesday, March 5 Mom2B's adopted by Tammy G.
Friday, March 8 Mom2B's adopted by Steve & Cindy T.
Friday, March 15 Mom2B's adopted by Jo M.
Tuesday, March 19 Mom2B's adopted by Ruth E.
Friday, March 22 Mom2B's adopted by Molly H.
​ Tuesday, March 26 Mom2B's adopted by Pam M.
Tuesday, April 9 Mom2B's adopted by Lorena O.
Friday, April 19 Mom2B's adopted by Jessica S.